Join us for our quarterly Stammtisch! This is the perfect opportunity to meet up with your batch-mates, seniors, juniors and TUM professors! This round, Lantiq Asia Pacific will also be sharing news on possible Industry Projects/PhD Opportunities available for our students/graduates. Come hear about these exciting opportunities on 12 September 2014 @ Brotzeit 313 Somerset! 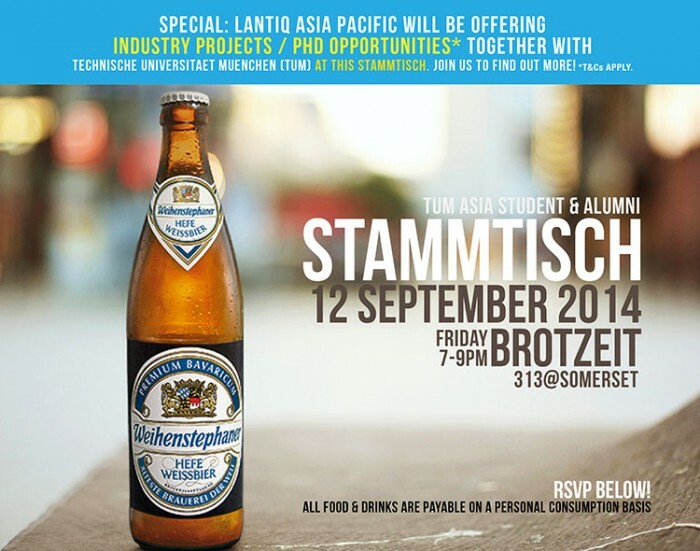 Register below if you will be attending the Stammtisch. Due to overwhelming response, the registration for the Stammtisch is now closed. We look forward to meeting the registered participants on Friday.